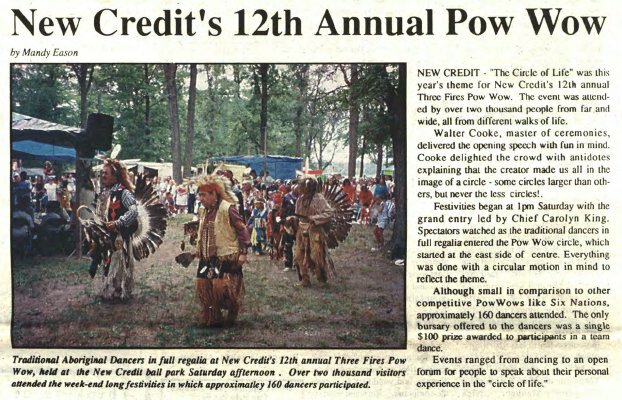 NEW CREDIT - "The Circle of Life" was this year's theme for New Credit's 12th annual Three Fires Pow Wow. The event was attended by over two thousand people from far and wide, all from different walks of life. Walter Cooke, master of ceremonies, delivered the opening speech with fun in mind. Cooke delighted the crowd with antidotes explaining that the creator made us all in the image of a circle some circles larger than others, but never the less circles! Festivities began at 1pm Saturday with the grand entry led by Chief Carolyn King. Spectators watched as the traditional dancers in full regalia entered the Pow Wow circle, which started at the east side of centre. Everything was done with a circular motion in mind to reflect the theme. 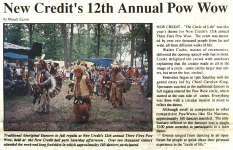 Although small in comparison to other competitive Powwows like Six Nations, approximately 160 dancers attended. The only bursary offered to the dancers was a single $100 prize awarded to participants in a team dance. Events ranged from dancing to an open form for people to speak about their personal experience in the "circle of life." Cooke, Walter ; King, Chief Carolyn.